I had a mad moment and decided to purchase all of the shades of ELF Shimmer Eyeliner Pencils. I suppose at £1.50 each and an extra 20% off with a promotional code it isn't that mad? All of these pencils come carded and as you can see the pencil lid is in fact a sharpener. The names of the shades are on the card but not on the actual pencils which stinks. For some reason they came a lot shorter than expected and with the £1.50 price tag, they really feel cheap and flimsy. What I think is really misleading is when they call it 'Shimmer' but to me these look like a pearl finish. I don't see any sparkle just pearl. The main thing is that the product itself is pigmented and has a beautiful texture, soft and glides like butter. I find that 'Black Bandit' seems the hardest to get off with a makeup wipe. These are all nicely long lasting. My favourite out of all these has to be 'Iconic Ivory' as I wanted a pearly white liner and 'Gunmetal' as it seems to flash a gorgeous green colour. Almost reminds me of MAC's eyeshadow in Club. 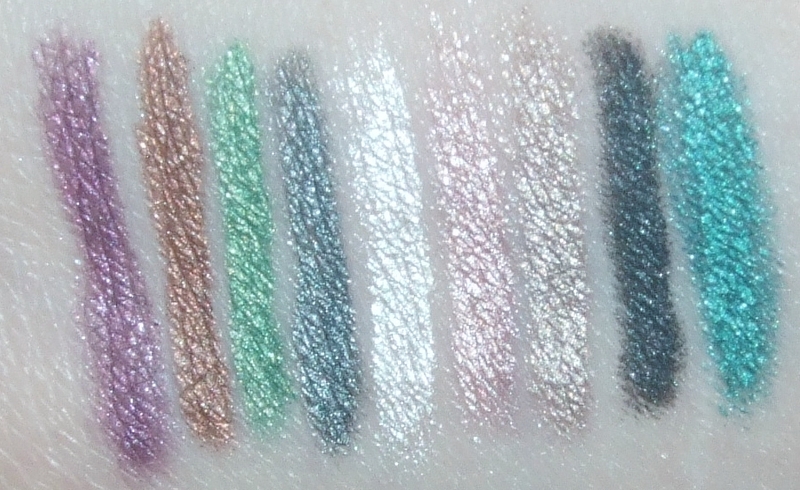 I'd love ELF to do some more shades in this range, like maybe a deep red and some blues. 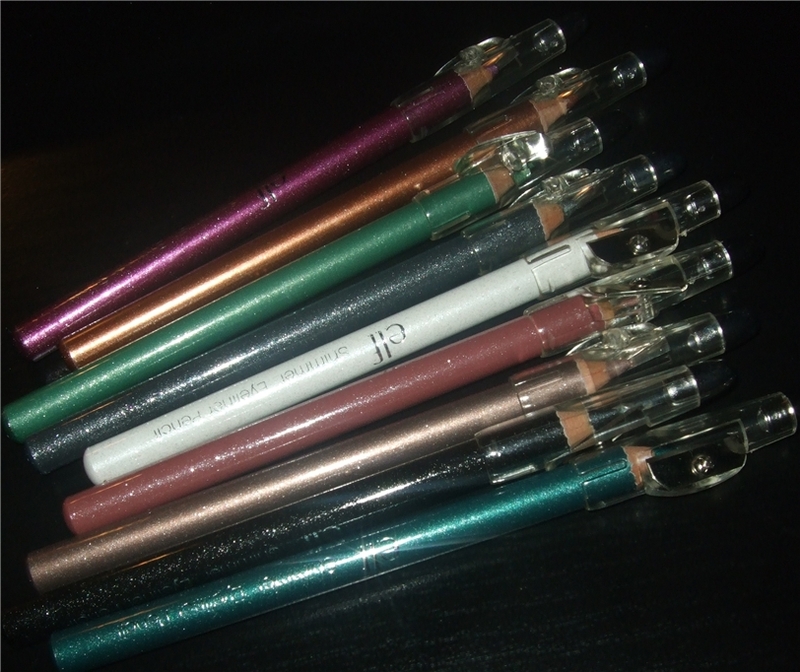 L2R- Plum Passion, Boldy Bronzed, Grassy Green, Gunmetal, Iconic Ivory, Precious Pink, Blissful Blush, Black Bandit, Twinkle Teal. OH MY LORD Twinkle Teal! All of them are gorgeous, but that one needs to be mine! These look quite similar to the MUA ones, but it might just be the lids. I love the shimmery white! Great colours, I like them very much. Easy to see why you bought them all. ooo i like the look of Precious Pink, Blissful Blush so pretty!